PULLMAN, Wash. – A Washington State University food scientist and colleagues at Texas A&M have found that compounds in peaches can inhibit the growth of breast cancer cells and their ability to spread. Writing in the Journal of Nutritional Biochemistry, the researchers say the compounds could be a novel addition to therapies that reduce the risk of metastasis, the primary killer in breast and many other cancers. The compounds could be given as an extract or, judging from the doses given mice in the study, two to three peaches a day. “I would do three peaches a day,” said Giuliana Noratto, WSU assistant professor of food science. The study also underscores the value of good nutrition in preventing cancer, she said. “Having enough fruits and vegetables that can provide these compounds in our diet, we might have a similar preventive effect,” said Noratto. She is now looking at compounds in wheat, barley, quinoa, apples and dairy products that could have a role in preventing obesity-related diseases. The research was part of her doctoral work at Texas A&M with plant breeder David Byrne, food scientist Luis Cisneros-Zevallos and toxicologist Weston Porter. She was drawn to the research after doing work on the antioxidant activity of root plants in her native Peru. 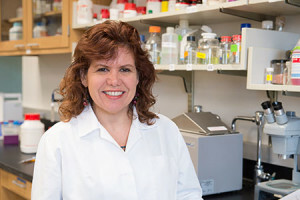 In 2009, Noratto and her colleagues at Texas A&M published a study showing that peach and plum extracts suppressed breast cancer cells cultured in petri dishes. For the new study, the researchers implanted breast cancers cells beneath the skin of mice. The technique, called a xenograft, is often used to look at the growth of breast cancer cells in a living animal, mimicking the interactions by which tumors form and progress. After giving the cells a week to establish, the researchers fed the mice varying doses of peach polyphenols, compounds that help plants ward off the damaging effects of the sun’s ultraviolet radiation. “There are several studies showing that these compounds act as antioxidants and can therefore protect DNA against damage that can produce cancer,” said Noratto, the first author of both studies. Other researchers have seen that phenomenon, Noratto said, but she and her colleagues wanted to know if the compounds might start a cascade of signals that could induce the cancer cells to commit suicide. Moreover, after 12 days the researchers saw that mice fed with high levels of polyphenols had tumors that grew less and without much of the blood vessel formation that can help cancer cells spread to other parts of the body. The tumors in those mice also had less evidence of enzymes involved in the spread and invasion of cancer. The doses given the mice, if scaled up to a 132-pound person, could be supplied by two to three peaches a day or a dietary supplement of peach polyphenol extract powder.